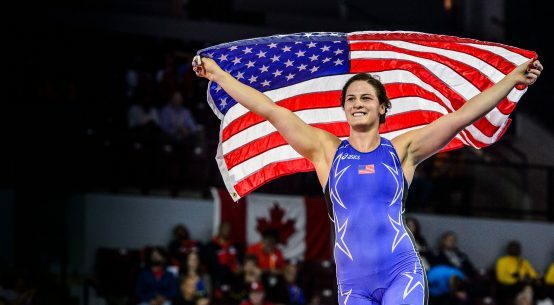 Gray is a three-time World champion who earned a spot on the 2016 U.S. Olympic Team with her victory at the U.S. Olympic Team Trials on April 10, 2016. Gray will face 2015 Canadian World Team member Justina Di Stasio in a match at 75 kg/165 lbs. Gray won World gold medals in 2012, 2014 and 2015, and is also a two-time World bronze medalist in 2011 and 2013. Gray is currently on a 37-match winning streak. She was a 2015 Pan American Games champion, is a two-time World Cup champion, and has also won World titles on the University and Junior levels. She is a native of Denver, Colo., and competes for the New York Athletic Club. Di Stasio competed on the 2015 Canadian Senior World Team. She won gold medals in the 2015 and 2016 Pan American Championships, and was a silver medalist at the 2015 Pan American Games. Di Stasio was second at the 2016 Canadian Olympic Trials. She was fifth in the 2012 Junior World Championships. Di Stasio was a three-time WCWA Women’s College national champion for Simon Fraser University. This is a rematch of the 2015 Pan American Games gold medal finals, won by Gray with a come-from-behind last-second score for a 9-6 victory. It will be Gray’s first time competing in Times Square at a Beat the Streets competition, and Di Stasio will be making her Times Square debut as well. Maroulis was a 2015 World champion at 55 kg, and has won a 2012 World silver medal and a 2013 World bronze medal. 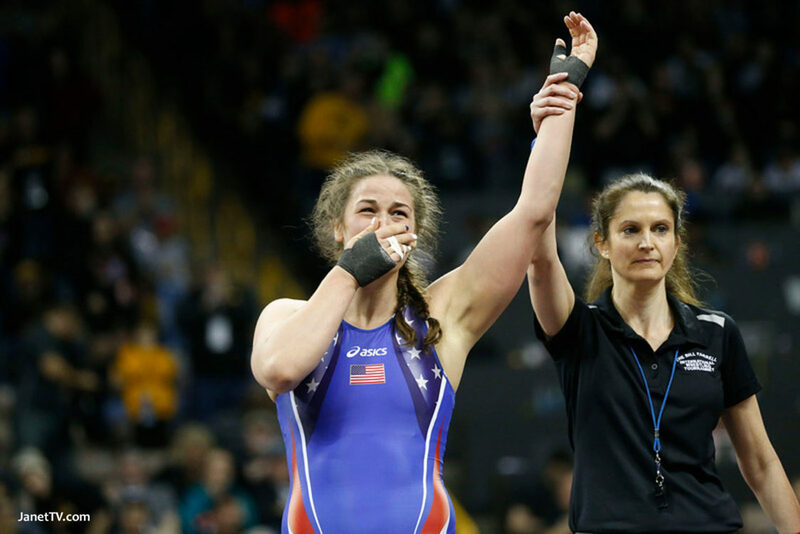 Maroulis recently won the U.S. Olympic Team Trials at 53 kg, and will be competing at the World Olympic Games Qualifier in Ulaanbataar, Mongolia, April 22-24, where she will attempt to qualify the United States for the Rio Olympic Games at her weight class. Maroulis is a six-time U.S. Open champion. 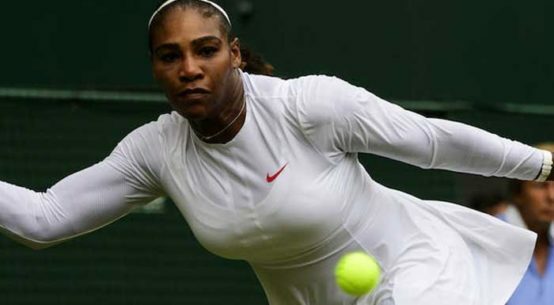 She has won two World Cup gold medals and 2011 Pan American Games champion. She won three career Junior World titles. Maroulis won four WCWA women’s college national titles for Simon Fraser University. She is a native of Rockville, Md. and competes for the Sunkist Kids. Samantha Stewart was a bronze medalist at the 2012 World University Championships, and was a 2016 Pan American Championships gold medalist. She placed fourth in the 2009 Senior World Championships. Stewart has won medals at international competitions in Germany, Canada, France, Brazil and Romania. She won the Canadian Team Trials in December 2015. Maroulis has competed in a Beat the Streets event three previous times, scoring victories in all of her bouts. She first competed in the “Rumble on the Rails” in Grand Central Terminal in 2013, pinning Irina Kisel of Russia in the second period. In 2014, she scored a pin over Marcia Andrades of Venezuela in 5:53 in Times Square at the “Team USA vs. the World” event. In 2015, she scored a 10-0 technical fall over Yamilka del Valle of Cuba in the “Salsa in the Square” in Times Square. This will be Stewart’s first appearance in a Beat the Streets event. Competitors for Team USA will also compete in men’s freestyle against world power Iran. There will be two Olympic-level matches and four Junior-level matches as part of the men’s freestyle competition. In addition, there will also be Greco-Roman competition on the card. These matchups will be announced at a later date. Billed as “United in the Square,” this will be the second time that Iran has been featured as part of the Beat the Streets Gala competition. In 2013, the event dubbed “The Rumble on the Rails,” was hosted in historic Grand Central Terminal and featured dual meets between Team USA, Russia and Iran. The world-class competition has been hosted in Times Square four previous times. In 2011, the United States defeated World Champion Russia, 5-2, the first sports event ever held in historic Times Square. In 2012, another U.S. vs. Russia dual meet was held in Times Square, along with the U.S. Olympic Team Wrestle-off for the 60 kg/132 lbs. position on the U.S. Olympic Team in men’s freestyle. In 2014, Team USA defeated a World All-Star Team in Times Square, 8-3. In 2015, “Salsa in the Square” featured a meeting between Team USA and Team Cuba in the three Olympic styles, held shortly after the historic change in USA and Cuban political relations. This will be the seventh straight year in which a major international-style wrestling competition will be hosted as part of the Beat the Streets Gala activities. In 2010, an all-star challenge featuring top U.S. wrestlers was held on the USS Intrepid, an aircraft carrier docked on the west side of Manhattan. Top Beat the Streets youth wrestlers will take the mat showcasing their skills in exhibition matches beginning at 3:30 p.m. to start the evening. A new feature to be held is the PSAL Girls Freestyle Dual Meet Championships finals, featuring the two top New York City girl’s freestyle wrestling high school teams from the spring girl’s freestyle season. Then it’s Team USA vs. Iran and other guests at 6:30 p.m., followed by the Beat the Streets Gala Celebration. The Gala Celebration will follow the wrestling competition. This unique and electrifying annual event helps Beat the Streets (BTS) raise significant funds to further its mission. Whether it’s providing a safe, constructive outlet for our urban youth, fighting childhood obesity, empowering women, or uniting entire nations, wrestling teaches persistence, dedication, and the value of working hard to achieve one’s goals, creates opportunities for personal and universal growth. BTS currently serve over 3,000 student-athletes every year. Note: USA vs. Iran freestyle matches and featured Greco-Roman bout to be announced later.